Welcome to Rick's Texan Reviews annual Salute to Opening Day (my favorite day of the year), where I review a baseball-themed film. This year, it's the comedy Ladies' Day, focusing on baseball wives. Ladies' Day is a delight from beginning to end, with delightful turns and zany situations. Sox pitcher Wacky Waters (Eddie Albert) is a phenom, unless a pretty thing catches his eye. His amorous adventures always end up distracting him to where the team loses. Fortunately, he is currently single, and both his teammates and their wives are set on keeping it that way. 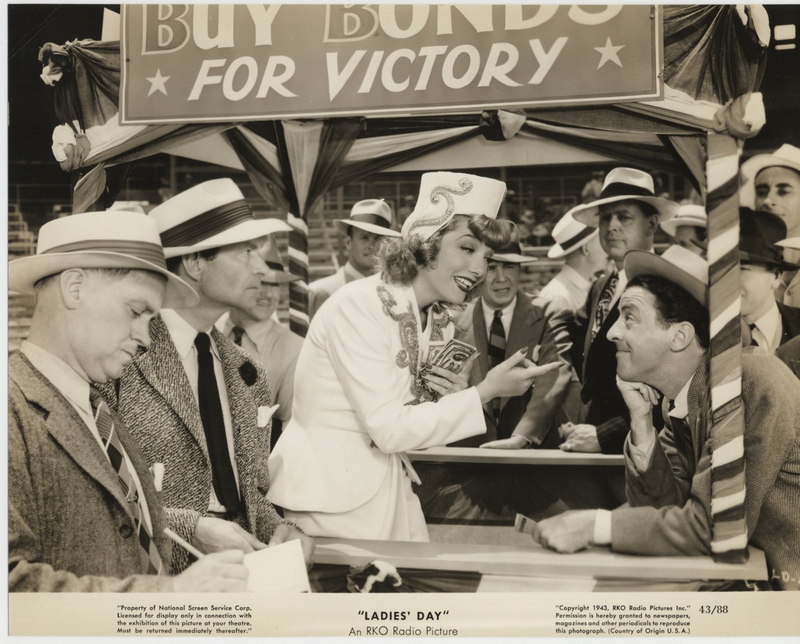 Then comes Latin bombshell Pepita Zurita (Lupe Velez) on a war bond drive through baseball stadiums. One look from the 'hot tamale' and Wacky goes bonkers. Pepita equally falls head over heals for her 'Wah-key', and the baseball wives all but kiss their World Series winning bonuses goodbye. Even after their quickie marriage Wacky is still unstable. A bit of good news comes their way when Pepita is recalled to Hollywood to star in Twenty-One Nights, forcing the couple to separate as the Sox chase the pennant. With Wacky able to concentrate on the game and Pepita filming, the team and their wives can breathe easy, that is until they discover Pepita has finished filming early and is rushing back to her Wacky. Now determined to keep Wacky and Pepita apart until the Sox beat the Acorns in the World Series, the Mrs. Sox collective, led by Hazel Jones (Patsy Kelly) decide to take matters into their own hands. They get to Pepita first in Kansas City and essentially hold her hostage until the Sox win. Little did they count on her escape, but after more screwballs things end happily for everyone. 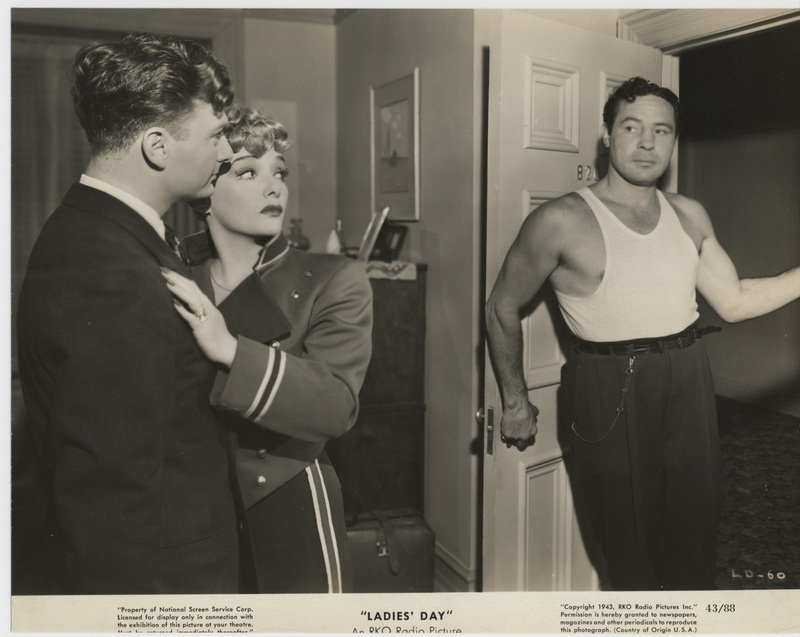 Ladies' Day pretty much starts out as a comedy with the idea of Eddie Albert as both a Lothario and the object of Pepita's affection. Albert is not a leading man type but he has a way with lines that make things funnier. As he contemplates reuniting with his beloved Pepita, he muses, "Ain't that romantic? Kansas City at midnight", making his lovelorn statement all the more hilarious. The film is filled with professionals able to deliver comic lines with a perfectly straight face. Patsy Kelly is the standout of the Sox wives, each determined to get their World Series bonus no matter what. If it means literally beating up her husband and push him around, so be it. If it means all but cajoling Pepita to get out of town, so be it too. As she pushes Pepita to return to her eager public, she tells her, "Think of it: Twenty-One Nights with Pepita Zurita". Velez, matching Kelly in the quips, gives her a somewhat startled, somewhat unamused double take. "Twenty-One Nights STARRING Pepita Zurita", she quickly corrects her. "It's in my contract to put that way," she adds. It's as if Pepita 'gets' what Hazel is suggesting and is more than able to stand up to her. Part of the humor comes from the "Mexican Spitfire" mangling her English and being extremely broad and even a little dim. She clearly does not know anything about baseball, loudly cheering for her "Wah-key" every time he throws balls thinking they're strikes and at the end shouting, "Wacky, please knock me a run home. Please do!". When she calls him to tell him she finished filming early and is on her way, she says "Yo te adoro" (Spanish for 'I adore you'). Responding to an off-air comment about 'a door', she tells him, "I tell you in English when I see you in Spanish". Velez is a natural comedienne, using her jumbled English to enhance the good-natured humor. As she reproaches the Sox players, she tells Wacky that their wives "kid-snatched" me. Velez makes Pepita a delightful comic character without becoming ridiculous, basically sweet but unaware of the chaos she unleashes. For classic short-subject fans, there's a cameo by George O'Hanlon, best known as the voice of George Jetson and known to contemporary audiences for playing the hapless Joe McDoakes in the Behind the Eight-Ball short subject films. Ladies' Day makes clear they are not selfish or greedy: each plans to use the money for their families whether in buying a small farm, setting up a little shop or bringing up a new baby (only one yearns for a fur coat). We also know that Pepita is essentially goodhearted, clearly in love with Wacky and unaware that she is a distraction. Perhaps this is why we can forgive the Sox wives for not just "kid-snatching" Pepita but at least twice knocking her out with a baseball bat. We only hear the sound effect of a light clunking and Pepita's soft moan but again given it's a comedy not meant to be taken seriously we forgive that. Ladies' Day focuses on the wives of baseball players. More often than not, particularly in biopics like Fear Strikes Out, Pride of the Yankees, The Stratton Story or The Winning Team, tend to have the wives look on their men adoringly and be fiercely protective and loving, almost worshipful. Ladies' Day, contrarily, makes them the bosses: sarcastic, sometimes belittling and even bullying towards the men they do love. It's a nice little comedy, with standout performances from Lupe Velez, Eddie Albert and Patsy Kelly.